Manuscripts and Archives Division, The New York Public Library. 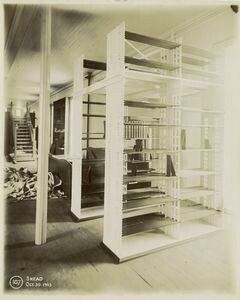 “Snead [stack sample].” The New York Public Library Digital Collections. 1903. I’m moderating the Archival Practices roundtable (#S709) this Sunday, 10 January, 8:30–9:45 a.m., 309, JW Marriott. The panel emerged from conversations with Christeene Alcosiba at the Rose Library, and Lisa Chinn, an English PhD candidate at Emory. Lisa and I submitted the following proposal, which I’ll share here. Practicing archivists and humanities scholars who engage with concepts of the archive do not always speak across the disciplinary divide. Antoinette Burton explains that oral history and the internet “has helped to prize open canonical notions of what counts as an archive” but that has also resulted in an “unease about the possibility that the archive is everywhere and hence nowhere.” Kate Eichorn observes “under the archival turn, the concept of the archive has all but lost its specificity.” As Rick Prelinger, one of our roundtable participants, tweeted last February, “The ‘archive’ is overtheorized; ‘archives’ (where the labor of recordkeeping takes place) are undertheorized and underfunded.” This roundtable aims to bridge conversations between archivists and literary scholars in order to gain critical insight into shared concerns around the arrangement and description of materials and the impact on access to and the discoverability of certain histories and texts. Our focus on “practices” is intentional. As the labor of archivists and the concept of the archive have diverged during the various archival turns of the past (at least) twenty years, we aim to create a site of intersection between “practical,” everyday archives and theoretical considerations of the archive. Building upon the interdisciplinary conversations in Eichorn’s Archival Turn in Feminism, Burton’s Archive Stories, Alana Kumbier’s Ephemeral Material: Queering the Archive, Gesa Kirsch and Liz Rohan’s Beyond the Archive, and Carolyn Steedman’s Dust, the roundtable investigates how the arrangement and description of materials impacts access to and the discoverability of certain histories and texts. As archive continues its vogue as a topic within the humanities, we would do well to share knowledge and insight among professional archivists, amateur practitioners, and literary scholars. Therefore, this roundtable will be of interest to library professionals, researchers and faculty who work on and in archives, as well as graduate students trained in the humanities who may be considering future work in libraries. Thus, the roundtable will focus on several themes: 1) the bridge between the practical and theoretical archive; 2) approaches and objections to the arrangement of literary and artistic archives; , and 3) grassroots archives and questions of organization, access, and discoverability. In his discussion of “outsider” places of collecting and the theoretical construct of the archive, Rick Prelinger will suggest elements of a critical archival discourse that would reconcile archive-as-concept and archival labor. Lisa Chinn will also address this divide between the “practical” and the theoretical in her discussion of non-traditional, multimedia texts. Multimedia texts naturally lead us to question the privilege of the paper manuscript in lieu of less traditional objects, like records, audio-visual, and digital files. Charlotte Nunes will read against the grain of British archival collections of institutions and people central to standard histories of literary modernism in order to highlight South Asian writers marginalized by these histories. Weatherly Anne Stephan will speak to the ways archivists attend to cultural and material indicators of a writer’s process and production, while processing a collection. Stephan will use as a case study the Tom Wolfe papers that have recently opened at the New York Public Library. In comparison, Tyler Schmidt will illuminate the ways black, gay, nearly forgotten African American journalist Frank Harriott’s fragmentary archive exists only tangentially within the official archive of his better known partner, the painter Karl Priebe. Schmidt offers a counter-archive, a self-curated “Midwestern archive” that conjoins several gay writers and visual artists eclipsed from the dominant/white narratives of queer cultural production on the East and West coasts. Megan Paslawski will explore what she describes as the problem/opportunity presented by nonhierarchical, consensus-based activist groups, and consider the difficulties of maintaining a radical queer archive. Finally, Jack McCarthy will discuss efforts to support archival practices and knowledge-sharing among grassroots, volunteer-run organizations which don’t have the resources to retain a professional archivist. McCarthy will speak about the Hidden Collections Initiative for Pennsylvania Small Archival Repositories (HCI-PSAR), which has been working with “archives without archivists” to help make their collections more discoverable by researchers, to enhance the stewardship of their collections, and to foster community among small archives. As the MLA considers literature and its publics, this roundtable will address the role of archives in making literary texts and histories publicly accessible. These presentations and the ample discussion that will follow will contribute to an ongoing conversation between archivists and literary scholars. Throughout the conversation, we aim to develop a critical vocabulary with which to advocate for public access and participation in archival practices.